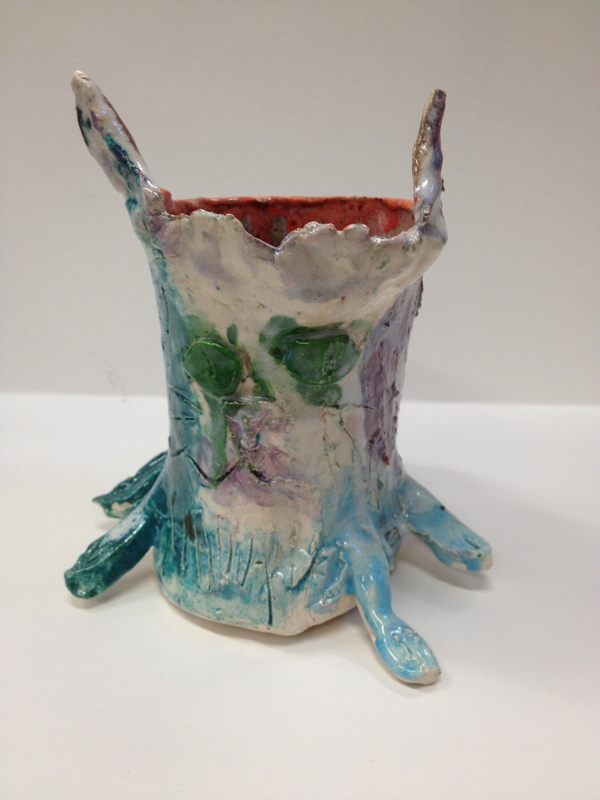 Each grade level has one clay project a year. 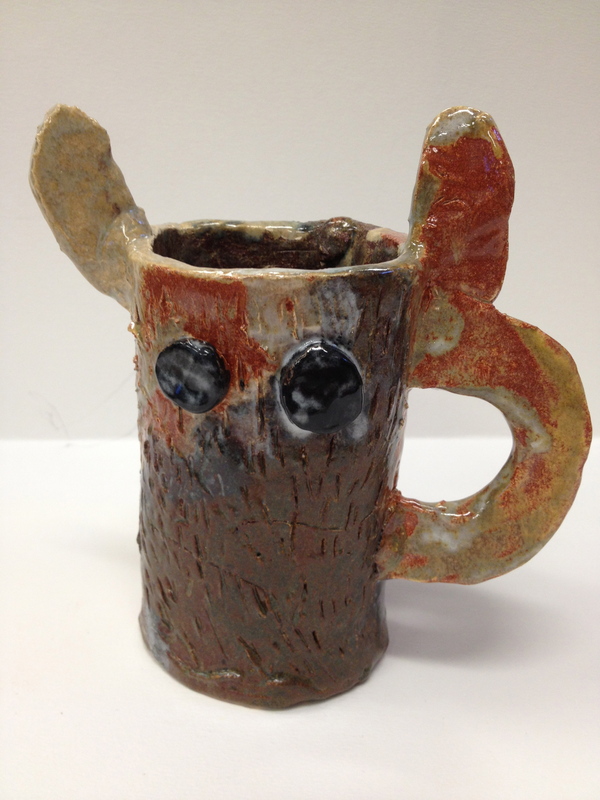 I’ve started a tradition of doing mugs inspired by Bruce Howdle with 3rd grade but with 4th and 5th grade, I change it up every year. 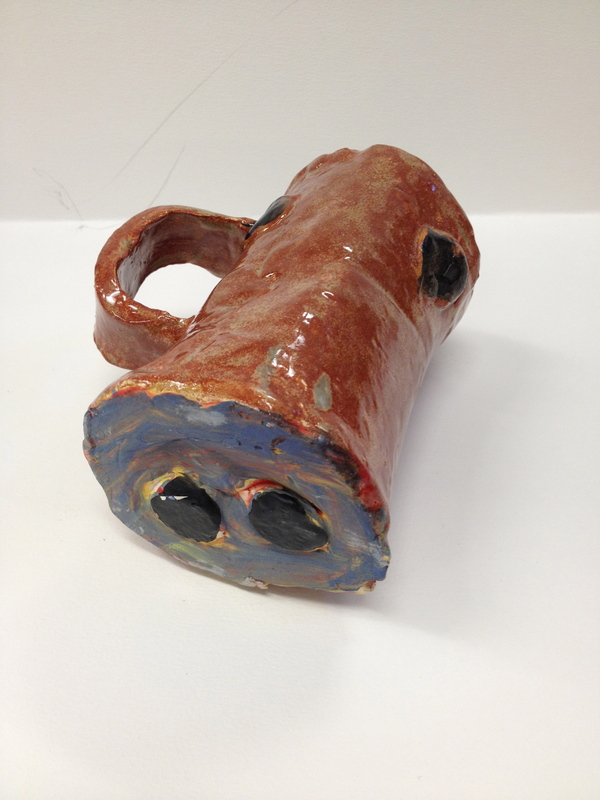 This year, 4th graders used their prior knowledge from creating cylinders for the mugs last year to create cylinders for be base of a birdhouse this year. Usually with clay projects, we spend time sketching and planning beforehand. 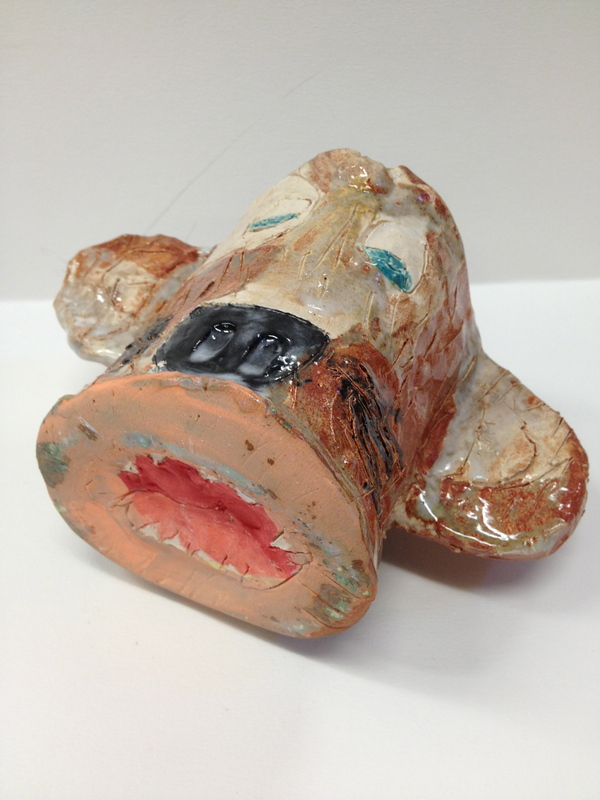 This year’s 4th graders have had a lot of more difficult projects with a lot more art history. I wanted one of the last projects of the year to be a little more open with a little improvisation (which we also spent a lot of time on this year). So with this project I told them they had to start with a cylinder, they had to have a handle and they had to have a hole for a bird to live in. After that, they could make it their own! 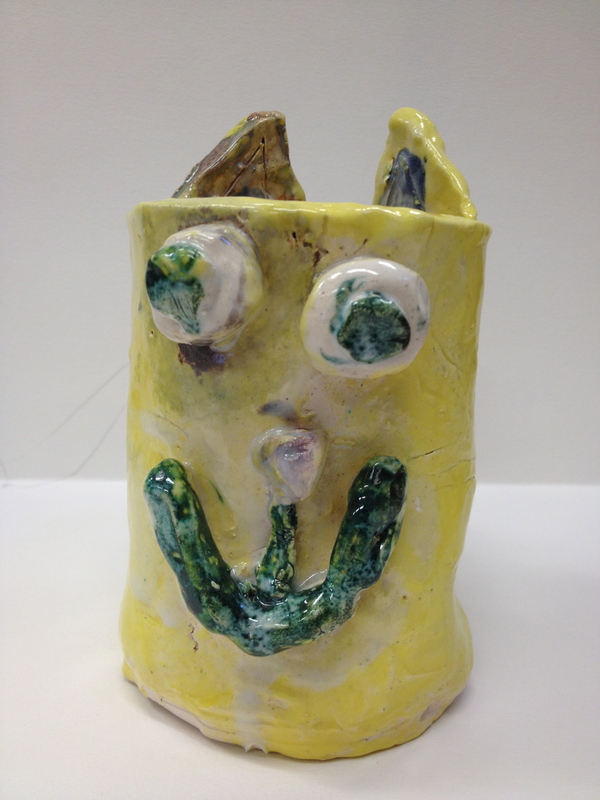 The 3rd grade clay project has become sort of a tradition in recent years due to it’s popularity with students and even the teacher! 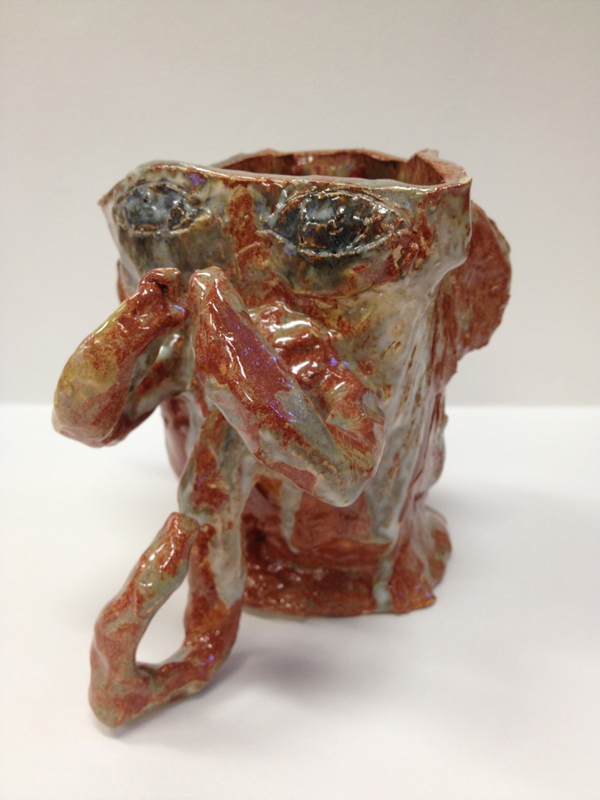 But this year, I had the pleasure of teaching the lesson that focused on the artist Bruce Howdle, a ceramic artist living and working very close to us in Mineral Point, WI. The artist is famous for his large ceramic installations and murals, vases, platters, humorous cups, and other ceramic pieces featuring animals as the main theme. 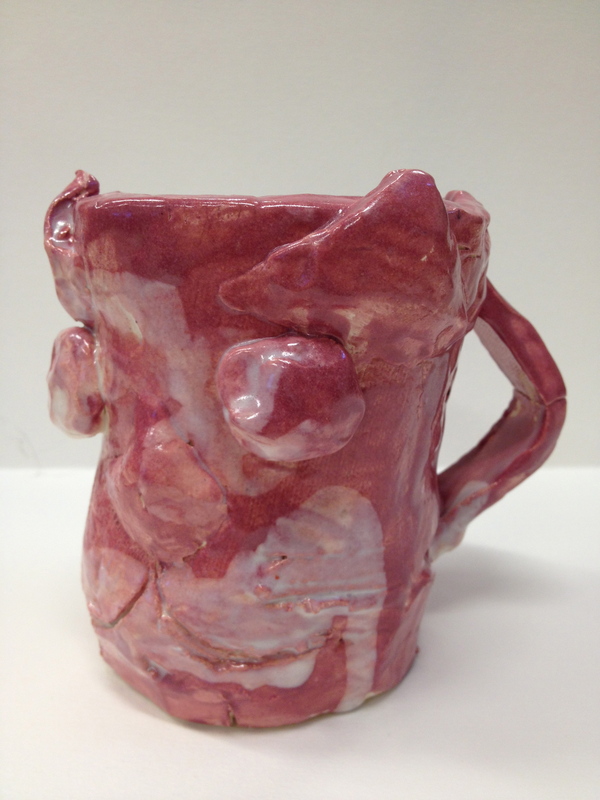 For our unit we focused on analyzing and interpreting his funny animal mugs! 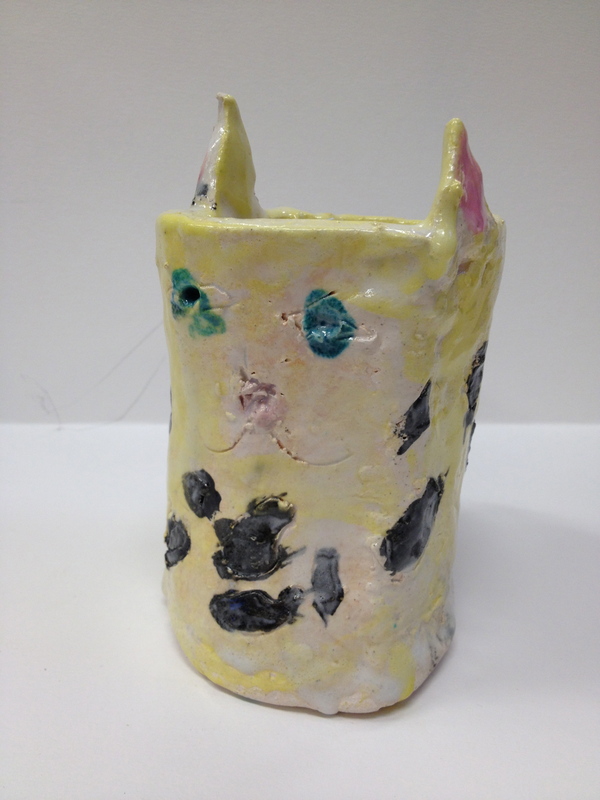 Taking inspiration from Bruce Howdle the 3rd graders designed and constructed their own animal mugs. 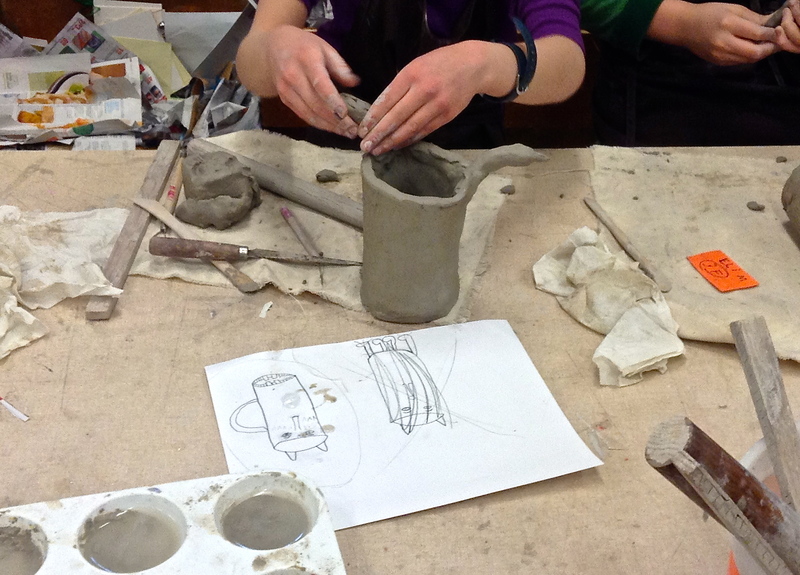 they students first spent time drawing out and designing their mugs. 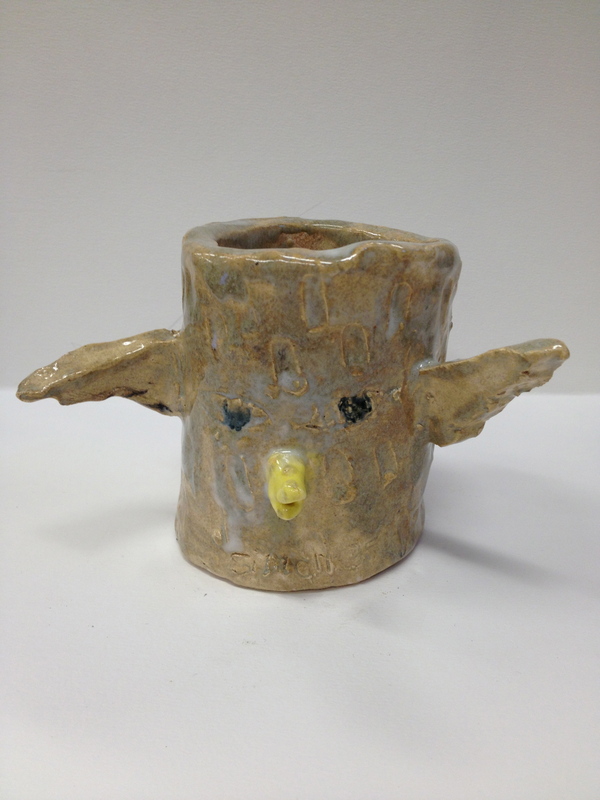 Not only did the students draw out their animal as a mug but they executed design drawings of what their mug would look like from a bird’s eye view, from underneath, and how the handle would be incorporated into their design. Many students also drew out their designs on paper cups to help realize their 2-D drawing as a 3-D form. We also had a discussion on shape vs. form, visual texture vs. texture, and non-functional vs. functional art. Once they got their hands on the clay is when the real fun began! 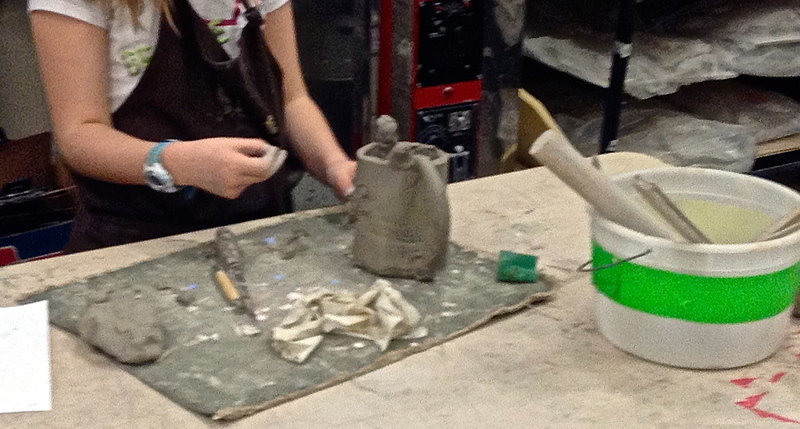 The students learned about rolling out a slab of clay, constructing a cylinder, scoring and slipping when attaching clay pieces together, and different techniques to add texture. 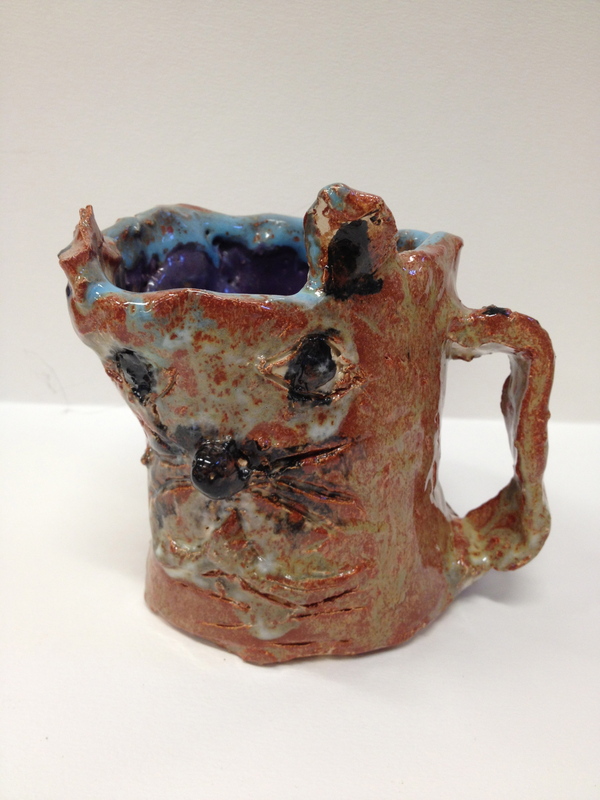 The next step was to let our animal mugs dry out so that they could be fired in the kiln. 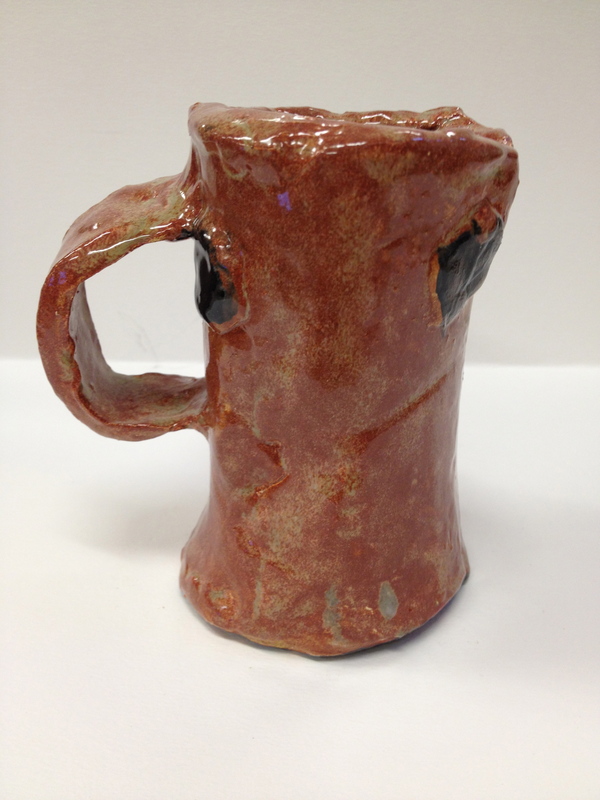 We were then able to glaze our mugs and make them functional pieces of artwork! This is an update from a previous post. Randall 5th graders finally all glazed their cakes! Well, most of them. I think I have 10 more sitting in the art room waiting to be finished. Most of them don’t have names on them. Many of them are still in the kiln because I started in the kiln the Wednesday before break. Then we had our two snow days so they are now just sitting there, finished, with no one to take them home until January. 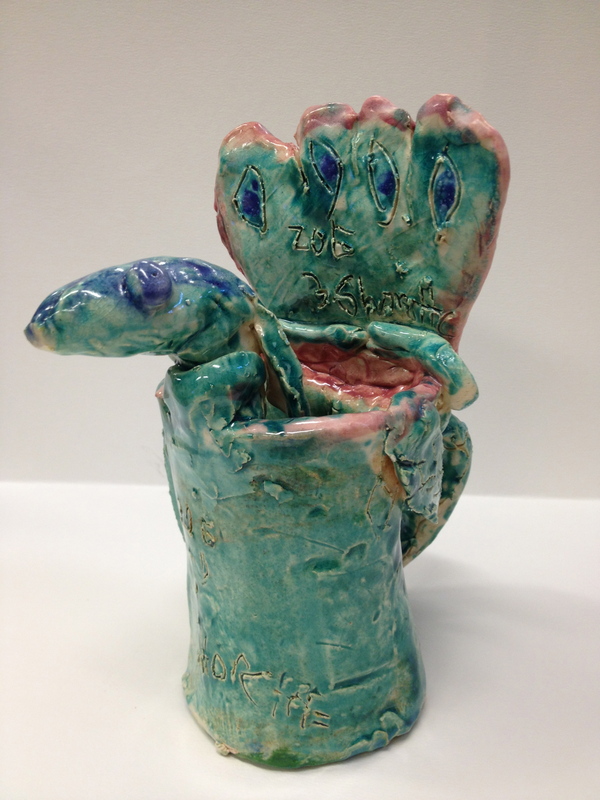 But they are beautiful and Randall 5th graders spent a lot of time thinking about details like texture and color and how to represent a flavor through clay. Wayne Thiebaud is a technically not a pop artist but his work is inspired by popular objects around him just like Pop Art. He started painting before Pop Art was Pop Art. So I guess he created Pop Art for himself. Wayne loved desserts. This was is favorite subject! We study a lot of art that tells stories and shows serious emotions. Wayne’s work is just fun. Sometimes, are is just meant to be fun! We focused on Wayne’s cakes. His cakes, in pieces, are triangles. We made them 3-D with clay and create triangular prisms. 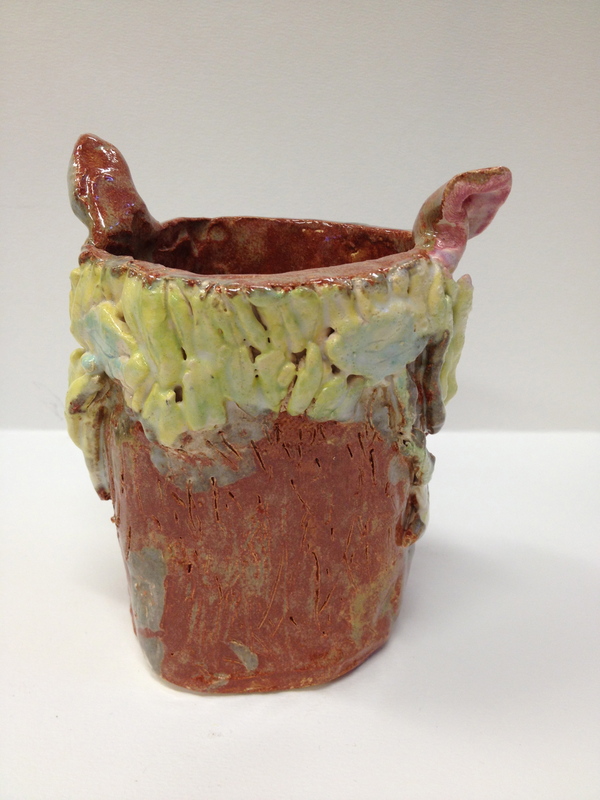 Here are a few of our triangular prisms in the greenware stage of clay. Greenware clay are clay objects that have been shaped but have not not yet been bisque fired, which converts them from clay to ceramic. Keep a look out for our finished, glazed pieces soon! From 8-10am, my art class has students going into 4th, 5th and 6th grades. from 10am-12pm, I have students going into 1st, 2nd and 3rd grades. This mix of ages has been interesting. Along with that, sometimes I have both classes do the same project and other times different projects. For clay, I had the older class pick their project and gave them skills to work off of. For the younger class, I had them all make rattles. Here is a dragon from a boy going into 4th grade. And a birdhouse from a girl going into 4th grade. Sadly, the rest of the clay projects were not finished. I don’t think our district has ever canceled school because of heat before! But it has truly been unbearable in the classroom and the students have been experiencing many heat related headaches and stomachaches. It is between 95 and 100 degrees in our classrooms! No, we don’t have air conditioning. So I am happy that our school board decided to cancel school for the rest of the week. But, that also means that we missed out on the last two days of class. I get a new group for the second three weeks of summer school starting Monday. So, now I have a group of unpainted clay projects from the older group. I wish I would have pushed them to finish them last week! Anyway, the younger group only has 3 students who didn’t paint theirs. The rest are finished. 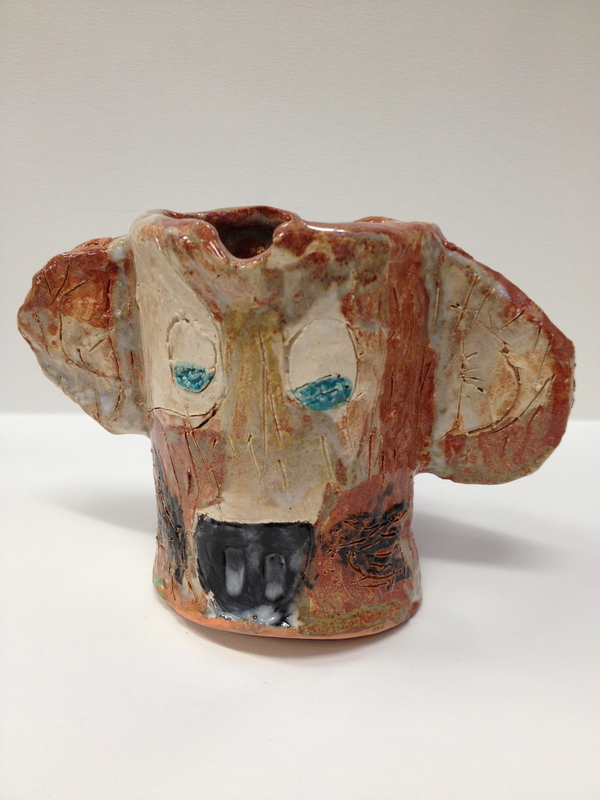 Fourth graders focus on Wisconsin artists. Last semester they drew from observation and created beautiful watercolors inspired by Georgia O’Keeffe. Then they took those 2-D watercolors and created 3-D clay sculptures inspired by the watercolors.